I am working on quite a few corporate identity projects at the moment and the question keeps coming up as to what should be on a business card and how vital a good design is these days for a small business. So here are some thoughts on the origin, relevancy and importance of the business card. With a history pointing back to the 17th Century, business cards, or ‘name card’ as they were first called, have been a consistent part of communications. Originally used to introduce the owner as a ‘calling’ visitor, the cards were designed to be just big enough to fit in the palm of a hand and to announce the arrival of its owner ‘in all his glory’. Whilst name cards were tailored for the individual, businesses used trade cards to advertise where their shops could be found in cities such as London (where at the time there was no formal street numbering system available. The arrival of printing methods also meant the change of the card design from woodcut or letterpress to lithography and subsequently to include tints and colours. Whilst very popular in those days, come the 19th Century (with new technologies and a wide-spread distribution of newspapers that allowed businesses to display their services more lavishly and prominently) businesses preferred to place adverts, leading to the decline of the trade card industry. Especially in the US, a distinction was made between calling cards and business cards, one serving social etiquette, the other trade and the promotion of products and services. 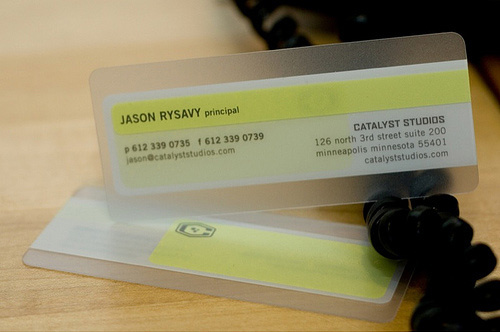 Today, we are probably still most familiar with business cards promoting brands – though individualised for the representative – though the availability of off-the-shelf printing solutions such as Moo or printed.com allow greater accessibility of affordable custom print services for those who want to promote their own personal brand. If you are looking to promote yourself or your brand, there are a few vital pieces of information that should be found on any card. But whilst you may be tempted to stick everything on there, and possibly everything on one side, it is one of the biggest design challenges to create a clean, clear and legible layout on 85mm x 54mm or thereabouts. This is easy – kind of. You want your brand identity clearly displayed as well as your name and professional title, should you brand use titles. Sometimes the use of lengthy acronyms is more off-putting than useful. It all depends on who you are trying to reach with the business cards. If you are a doctor, surgeon, lawyer or any professional where titles signify the level of experience and the specialism and you are targeting people who understand and value the expertise these titles imply, then by all means include them. Sometimes however, a brand will benefit from steering clear of the use of titles to create a more accessible, friendly, non-differentiating culture amongst its staff and brand ambassadors. Business cards offer the opportunity to visualise an ‘elevator pitch’. As such, the ‘what do you do’ part needs to be concise and memorable, avoiding endless lists of buzz words relating to your industry. Also beware that once you write down certain areas of your business, people tend to assume that this is all you do so you may miss out on inquiries relating to those areas you did not mention. A clearly defined brand essence and core brand message will help to get people interested enough in your brand to engage and find out the details on a website. Depending on how you operate, you may or may not include a physical address here. These days, every business should have a thought-through and well-designed web presence that contains these details for those who need them. However, it depends on whether you are operating from multiple sites, whether you are a local consultancy looking to attract visitors to your offices, whether you are selling a product and really only want web traffic. Think about what you want to ideally happen when someone picks up your card and is interested. That should dictate how much you disclose about your whereabouts and also how you would like to be contacted. If online and social media is your aim as a communication platform for engaging with your clients, this would mean the inclusion of relevant icons and perhaps a QR-code. These are constantly evolving and you can now include little brand icons within them to make them more your own. Whilst the common size of the business card is practically dictated by wallet and business card holder sizes, there is some flexibility in width and height you can play with. I would never suggest to go too crazy as it may backfire – unless of course you are making a statement and have a solution in mind so the size becomes an asset to your brand. This elongated format still fits in a wallet but stands out not just by the material used, but by the size as well. As mentioned above, there are certainly restrictions to the shape of a business card which needs to remain practical or may just end up in the bin with all the other uninteresting print material. However, even subtle elements that make the shape special and relevant to the brand can really make your business stand out. One or more rounded edges, a cut-out bit, a rough boarder – look at your brand essence to see if there is some element that can be visualised by an alteration in the shape of your business card. Who says round edges are all you can do? If it works for the brand, an unusual shape can greatly enhance the brand message. There are cases, where you want a lot of information in a small space. That does not mean it has to look busy or cluttered. The challenge of the designer is to find the right balance, the right size and the right fonts (which is why business cards are usually part of the brand identity design development, where type faces and colour palettes are defined). Even if you have quite a lot of information to display on a card, using clean typography and leaving plenty of ‘white space’ will ensure legibility and that the type does not take away, but adds to the brand identity. Colour greatly affects how people perceive your business. They are of course part of your brand identity and but a business card gives the opportunity to make bold statements and to use colour in an innovative way. Double sided cards come to life with one side displaying a contrasting colour. Sometimes, less is more and the subtlest shades create an amazing effect that supports your brand message. Here is a sample of a brand ID for an interior designer. Keeping the colour scheme cool and contemporary and printing two coloured business cards at a time reflects the nature of the business as much as the hand crafted logo design and paper choice. When working with a printer who either accommodates variations of colours or designs or sets up a job bespoke for you, there is always the option to include different colours, patterns, backgrounds or content on a business card set to create a versatile, collectible feel. It’s something worth considering especially for B2C customers. This restaurant has a quirky, colourful interior and the business card set reflects this by coming in two distinct variations. It always creates some magic when you can visualise the brand essence of your business. A tire company with a tire profile across their card. A nitting shop with a needle effect. A visual on the name, such as this example with ‘Hidden’. Once you know who you are, you can play with it to great effect. In this example, the company played with their name ‘hidden’ and created a fun and memorable design. The material a card is printed on can be as simple as plain paper or as crazy as a bit of wood – if it fits the brand, innovative materials can really bring out the brand message. There are thousands of specialist papers out there, and companies such as Fedrigioni, GFSmith and Robert Horne work closely with designers to achieve the best creative solution. When it comes to the ‘printability’ of the stock, I would always recommend to work closely with a printer to ensure the design will translate well into print. Sometimes, a ‘wet proof’ is the best option where by the actual paper, inks and print finishes are used on the actual press to create a proof. It’s expensive, but especially if you are using experimental papers and printing methods, it can save hundreds of pounds later if something does not go quite as expected. Other materials, such as rough card board, Priplak (polypropylene), soft plastics or even wood can be utilised to create a unique feel and special effect for the brand. On this example, we simply used a matt laminated card that avoids fingerprints and is sturdy enough to give the card longevity as it is meant to be kept in the wallet for future reference. In this sample, we used copper foil to enhance the visual of this alternative therapy brand. What else is there to think about? Business cards are one of the smallest print materials every brand should call their own – but they are also one of the biggest opportunities every brand should make their own.